Sixth lunch: A Cubed: Alisha W., Haley P., Alyssa P., Genay M., Natalie H., and Trianna B. They Came. They Saw. They Partied! Remember all those guys and gals who won at trivia last Friday? You remember, Team Superior (brilliant yet bobbyish), Team # 3 (boring yet brilliant), and The Pink Draculas (brilliant yet beautiful–plus Tim). Well, here they are enjoying the fruits of their labor: pizza, Coke, Sprite, popcorn, and cupcakes. The first round of trivia was so successful that trivia will be back on December 12!!!!! 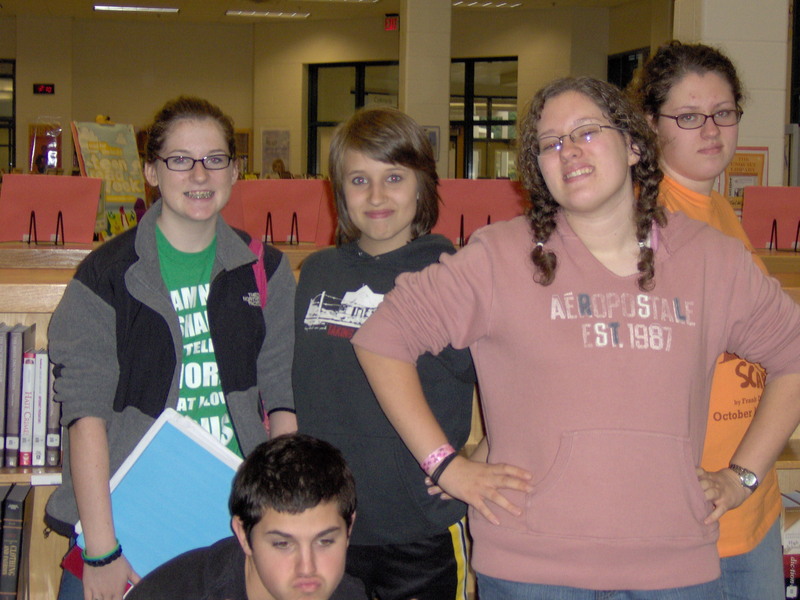 To see the entire set of pix, check out Mrs. Hamilton’s flickr photostream. Stop by the media center for a form and get your team signed up ASAP. The deadline to sign up your team is Monday, December 8. Who will win next time? Will it be new competitors “Er”? Don’t think they have what it takes to take on the champs? We shall see! Trivia Winners Take the Prize! Three tough teams out of Creekview trivia 23 teams of braniacs proved themselves worthy of the challenge today by answering tough questions and defeating their honorable opponents. The winning team from fifth period lunch was Team Superior, featuring Nathan K., Craig B., Kyle S., Ben S., Caleb C., and Cory N. You may recall that several of these guys were on one of last year’s winning teams, The Ricky Bobbys. Team #3 was the winner (yes, you are right, that is the most boring name in history, but at least they’re smart!) composed of Alex, Gabby, Aaron, Brecken, and Shelby. In sixth period lunch, the Pink Draculas, featuring Lana B., Nicole W., Ashley C., Kaitlyn C., and Timothy M. defeated all challengers to take the crown. You may recognize some of these players as members of one of last year’s winning teams, The Sassy Six. Congratulations to all participants, you did a great job, guys! We’ll post better pictures next week when we snap some at the pizza party which will be held on Thursday during each lunch! Thanks to everyone who participated and to Dr. Eddy for the snacks. · Forms must be returned to Mrs. Fleet, Mrs. Hamilton, or Mrs. Beasley. 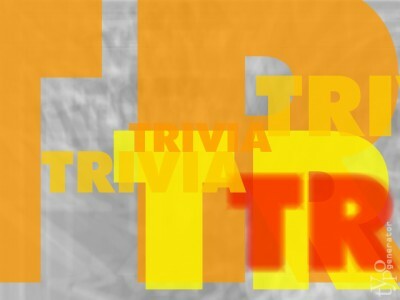 · Trivia will start promptly at 11:45, 12:45, and 1:45. · Bring your own lunch. · Snacks will be provided also! You Asked for It; You Got It–Trivia! The Blatant Bibliophiles will sponsor Trivia Friday on Friday, November 14 in the media center during 4th, 5th, and 6th lunches. Please see Mrs. Fleet, Mrs. Hamilton, or Mrs. Beasley to sign up your team. All teams must be registered by Monday, November 10 in order to participate. There is a limit of six students per team, and obviously all members must be in the same lunch. The winning groups will share the prize, which will be awarded to the winning team of each lunch period. Trivia will start promptly at 11:45, 12:45, and 1:45. This will give you fifteen minutes to run errands, hit the restroom, or pick up a lunch (which you can bring to the media center–or you can bring a brown bag lunch). We will also provide snacks! See a media center staff member for forms and get them back to the media center ASAP. And don’t forget, we love cool team names. But keep it school-appropriate. 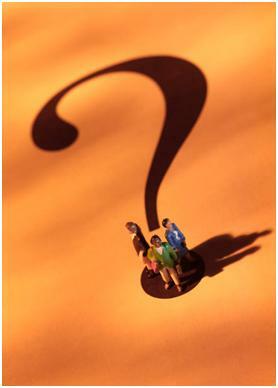 To Trivia or Not to Trivia? That is the Question? Remember how much fun we had playing trivia last year? Well, maybe, just maybe we should do it again. If you would like for the Blatant Bibliophiles to bring back trivia for 2008-2009, reply to this post by clicking on the title and leaving a comment. Check out the blog manners above if you don’t remember how to leave a comment; mainly, just remember to enter your first name only when you’re online. You can help out with trivia by participating, encouraging your friends to participate, and maybe helping out with getting the refreshments out if you’re not participating. Have You Tried GlassGiant, Bibliophiles? Remember all the cool graphics you can make on ImageChef? Well, if you have already made millions of cool ImageChef images, you might also want to try GlassGiant. You can make lots of cool graphics, enjoy some “fun and games” (for example “Pumpkin Masher” and “Word Scrambler”) and even try your hand at “geek stuff” such as counting to 31 on one hand or making a trebuchet that can fire balls of Play-Doh! The images can be posted to your blog, website, or your MySpace or FaceBook page. I did have some issues with embedding to WordPress, but all I had to do was save my lovely image and upload it.